Thread lifting is an effective treatment for facial sagging. This minimally invasive treatment involves skillfully inserting biodegradable Poly L-Lactic Acid threads under the skin. This material has a long history of use in the medical industry and is entirely re-absorbable. These special threads have cones along their length which act as scaffolding under the surface of the skin to lift sagging soft tissues. The threads dissolve after 6-8 months. During this time they stimulate the production of collagen, elastin and hyaluronic acid, thickening and strengthening the skin from within and improving elasticity so it retains a lifted appearance for up to 2 years post treatment. Facial Threading is the only treatment to combine these dual procedures in an unprecedented two-stage action. 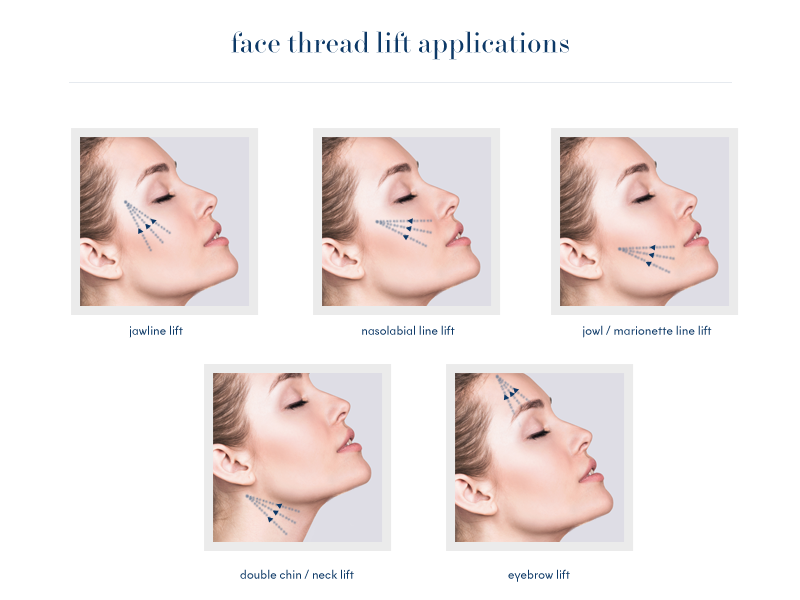 What we love about thread lifting is that it can be carried out on a variety of areas including jowls, cheek, neck, and lips. Renowned for her natural results, Dr. Bell, will work with you to develop a bespoke treatment plan which will boost both your natural beauty and your confidence.